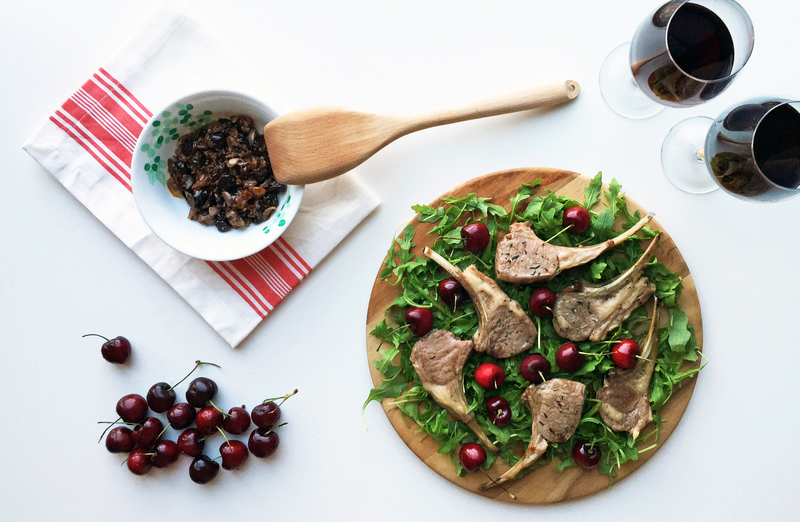 Lamb chops are my go to dinner menu when I want to do something special. They are so good as they are, but also incredible with fruity sweet and sour sauce. 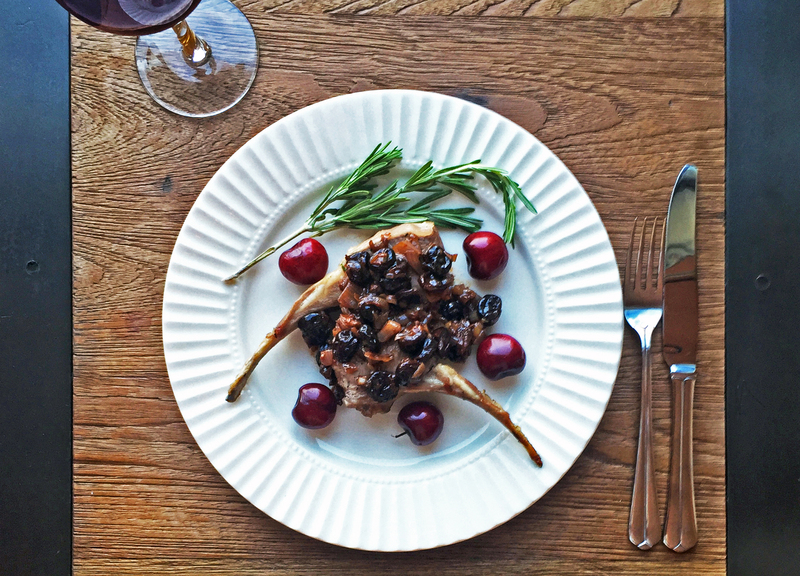 This sauce has intense and tart cherry flavor as well as warmth from marsala and cinnamon. I’ve roasted lamb chops in the oven instead of pan-frying (which is perfectly fine as well) so I could pay attention to the sauce while the meat is cooking. Great dinner party dish if you want to impress without hassles. Place dried cherries in a mug and cover them with boiling water. After 20 minutes, drain them and save the water from drained cherries. Mean while pre-heat the oven to 180C. 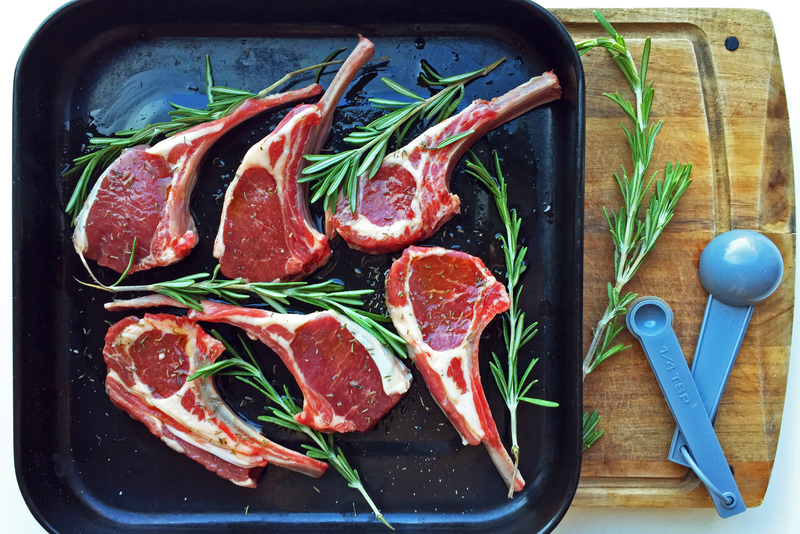 Pat dry lamb chops with paper towel, place them in a roasting tray and set aside in room temperature. When dried cherries are ready mix with stock and water from drained cherries. Chop shallots and set aside separately. 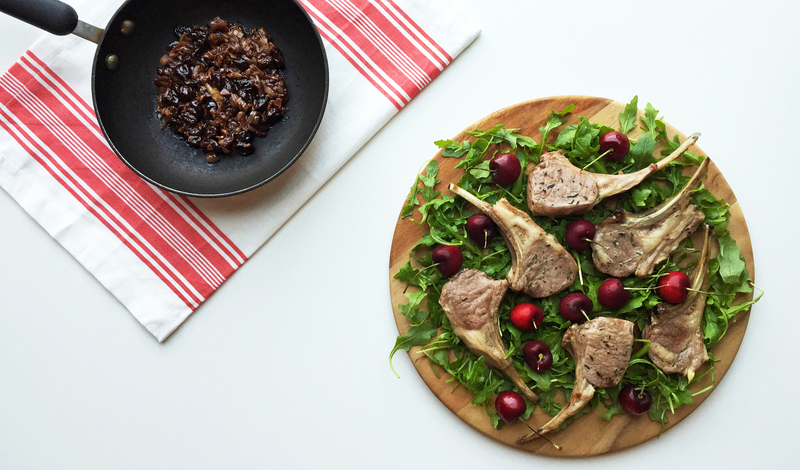 Pour and rub olive oil over lamb chops, distributing evenly on both sides. Season them with dried thyme, salt and pepper. Add rosemary springs between each lamb chop and place the tray in the oven. Cook for 10-11 minutes for medium rare turning the meat halfway through. Cook a few minutes longer if you prefer medium or medium well-done lamb. While lamb chops are cooking, add olive oil and shallots in a medium heat pan. Cook for about 3 minutes until soften. Stir in crushed garlic, stock, water from drained cherries and ground cinnamon. Cook for 5 minutes bring the heat down to low and simmer for 4-5 minutes. Add 1/2 cup of marsala wine and simmer for another 5-6 minutes, or until the sauce is reduced to a consistency you like. Make sure to rest the lamb chops for half the time you cooked before you cut. Plate them with sauce and a few fresh cherries. Peppery rocket leaves also go well with the lamb.